The largest green roof in Indiana, at 79,096 square feet, has been installed on the University of Notre Dame’s Joyce Center, home to the Fighting Irish Athletics Department and the Purcell Pavilion arena. Installation of green roofs is one strategy in the University’s Comprehensive Sustainability Strategy to cut its carbon footprint in half by 2030, which University President Rev. John I. Jenkins, C.S.C., announced in September 2015 in response to Pope Francis’ encyclical Laudato Si’. The Joyce Center green roof is believed to be the largest at any U.S. college or university. Spanning nearly 2 acres of space along and between the double domes of the Joyce Center, the roof surface is the fifth living rooftop installed at Notre Dame. The University’s other greenscapes are atop the Morris Inn, Corbett Family Hall, Duncan Student Center and O’Neill Hall. At more than 122,000 square feet, the University’s total living roof system makes up the largest vegetative roofscape in Indiana. The Joyce Center green roof was designed and grown by LiveRoof from Spring Lake, Michigan, and installed by Midland Engineering Company of South Bend. In total, 32,798 trays of plants form the design. The layout consists of 25 plant species, including 22 varieties of sedum. A rooftop irrigation system also was installed. Green roofs provide immediate and long-term benefits to the structure and surrounding environment. They are proven to mitigate stormwater run-off, improve air quality by reducing carbon dioxide, provide noise insulation, naturally insulate to keep indoor temperatures lower during warm months and higher in cold months, and conserve rainwater for release back into the atmosphere. A green roof also shields a roof surface from ultraviolet radiation, thus limiting the photo degradation of the roofing components. It is estimated that the Joyce Center green roof could extend the life expectancy of the existing roof membrane by 200 to 300 percent. 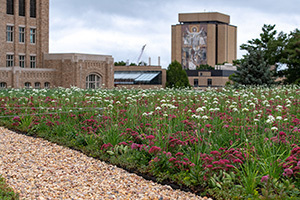 Notre Dame’s green roofs address the conservation of water, energy and other natural resources. By implementing green roofs, the University ensures that water sources are well-protected and naturally recharged. The University has taken a holistic approach to reach its sustainability goals, which also include a commitment to cease burning coal entirely by 2020. Along with the green roofs, Notre Dame has installed multiple geothermal fields, solar arrays and a new natural gas line; built a new 30,000-square-foot thermal energy production and storage facility; begun work on a hydroelectronic generation facility in downtown South Bend; switched to energy-efficient non-LED lighting in about 95 percent of building space; and more. The University expects to end its coal use next year, well ahead of its initial projection. Originally published by Sue Ryan at news.nd.edu on September 28, 2018.